FeedBurner, hit a double yesterday with their new Uncommon Uses service. They both enhanced their analytic service and set up a great conversion opportunity for themselves. First, the analytics. Those of you who know FeedBurner already understand that they are the company that handles your feeds – tracks them, measures them, gives you tools to enhance them, etc. Yesterday, they unveiled their Uncommon Uses service, which tracks strange, different or just uncommon uses of your feeds. For example, they showed me that one site is a blog that pulls together many web analytics feeds, and I was featured. They also unveiled (or at least, showed me for the first time) Aggregate Item Use — i.e. which posts get clicked on the most. (Note: I learned that my recent post on Campaign Codes, which I thought was too techie for the marketing people and too simple for the techies, was my most popular.) 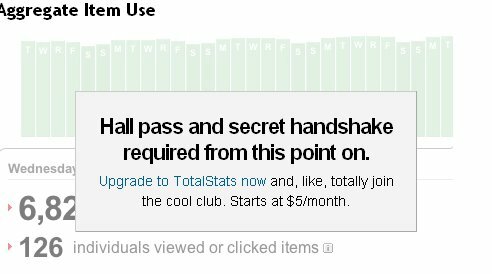 But to access Aggregate Item Use, one needs a secret handshake, or at least a subscription to their Pro Service ($4.99/month for 3 feeds or less). They showed me what I’m missing. I’ve been using the service for three months now, and this is the first time I have even wanted to pay five bucks a month because it’s the first time they’ve showed me what it can do for me. Or to paraphrase a recent post, I saw what was in it for me. They didn’t scream at me when I tried to access this member’s only part of the site (Like those awful error messages, “Subscribers only – Keep out.”) Instead, they handled it with humor and made me feel like I wanted to spend the money. And so, I did. Spend the money, that is.